When assessing our results, the ACR investment team does not generally consider market volatility, global output, or political events. Nor do we emphasize the annual total return of our portfolios. One-year results are more likely to reflect random market noise than useful information about sustainable returns. Instead, our focus is on corporate performance as reported in financial statements, since corporate cash flows and the prices we pay for them ultimately determine investment success. On that score, 2018 was surprisingly a good year. A few rough company level statistics will help illustrate the point. The average EQR strategy company held for the full year grew revenue ~9% and cash earning power ~11% on top of a 3%+ dividend yield3. 2018 results were surprising since in our view they were not reflected in market prices. A more comprehensive elaboration on EQR strategy fundamental performance compared to stock price performance will be presented later in this commentary. ACR strategy investment performance can be found at www.acr-invest.com/strategies. This past December’s sharp stock price declines were unnerving for many market participants. Even though long-time ACR investors know that the investment team welcomes volatility, we think a message of “don’t worry, buy the dips” is disingenuous. Overall stock prices are still very high, debt yields of many companies do not adequately reflect their risk, and the US economic cycle is likely in extra innings. Investors are right to be concerned about the risks. Stock valuations in our view remain among the most worrying. The overall US stock market P/E was 28.44 on December 31, after precipitous price declines. To put stock market valuations in perspective, the only years in which the P/E exceeded 30 since 1926 were 1928-29, 1998-2001, and 2017-18. While there is no economic law that says stock prices must decline to some historic P/E average, ACR’s foremost mandate is to protect our investors’ capital. In our view, taking a defensive posture toward the overall market remains a prudent approach. Fortunately, ACR does not have to invest in the entire stock market. This brings us to the most important news of 2018 from our perspective. 2018 marked the first year in several during which we observed meaningful intra-market equity valuation discrepancies (wide variations in valuations including significant under-valuation within a market). The two general ways to make money in financial markets are to (i) buy when the entire market is low, and (ii) capitalize upon intra-market valuation discrepancies. 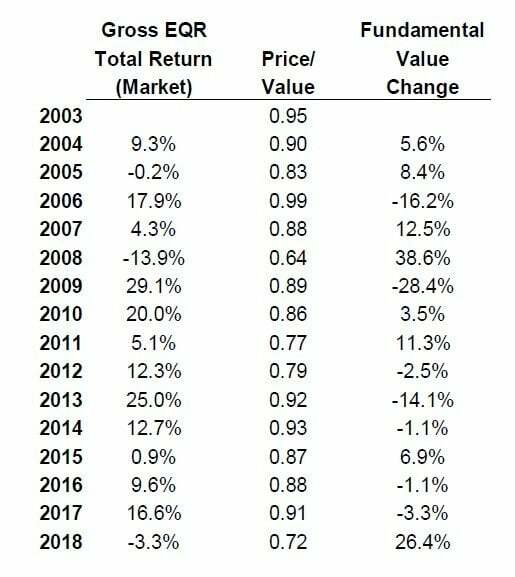 When intra-market valuation discrepancies develop, we can remain fully invested even when the market is at all-time highs, as we were at our founding in 1999. For the better part of 2016-2018 we found few intra-market valuation discrepancies in the equity or debt markets. In the second half of 2018, pockets of equity market opportunity began to materialize in certain industries. Auto parts suppliers, telecom operators, and financial services firms declined throughout the year. After a long dry spell of new purchases in our flagship EQR strategy, we were able to add three new holdings in December. Encouragingly, the investment team is busy looking at several opportunities which did not exist at this time last year. The paradox of being a fundamental value investor is that discrepancies between price and value create opportunity, but they can also make the value investor look wrong. In fact, the longer they last, the more wrong we look. Then one day market conditions change, and suddenly we look smart again. The main reason for this paradox is that on a certain level the market is always right. That is, the market represents precisely the price at which a business or its securities can be bought or sold today. Not surprisingly, confusion between price and value is a main reason that there are discrepancies between price and value. Market participants sometimes confuse the market price today with the “correct” price. Academics and practitioners alike agree that the “correct” price is the best estimate of fundamental value. The only argument is whether the price is sometimes “wrong” (i.e., the current market is misguided) when compared to the “correct price” (i.e., the best fundamental value estimate). ACR clearly believes the market is sometimes wrong, and we have waged both our livelihood and personal capital on this premise. Assuming our job is to get the best value possible for our investors’ money by taking advantage of discrepancies between price and value, the most basic requirement of the job is to keep our eye on the ball of corporate performance. We are charged with separating the “profit signal” from the “market noise”, since corporate performance establishes fundamental value. Previously we provided a few rough gauges of corporate performance in terms of revenue, earnings, and dividends for the average EQR holding. A more comprehensive way for us to assess corporate performance, and our effectiveness at getting good value for our investors’ money, is to use our price/value statistic to calculate the change in fundamental value compared to the reported total return (price gains + dividends) 5. Our price/value statistic is the market price compared to our appraisal of fundamental value. A price/value of 0.75 means we believe a stock is selling at a 25% discount to its fundamental value. The “fundamental value change” represents the change in price/value which was not reflected in market prices for the year. A positive fundamental value change reflects our assessment that value increased relative to market prices; a negative fundamental value change reflects our assessment that value decreased relative to market prices. Over time our price/value statistic should be fully reflected in total return (see our commentary from April 2018 at www.acr-invest.com/commentary/38-commentary/135 which demonstrates how EQR fundamental value and total returns have aligned in the long-term). The previous table shows that there can be major divergences between market prices and our assessment of fundamental value in the short-term. An additional elaboration on the nature of these two figures will help explain why. Market prices are based on today’s trading of securities by market participants. Fundamental value is earned in the future as dividends, interest, and principal is paid, or as per-share business growth accrues. The two are derived from entirely different sources. Market price is established by market participants who often react emotionally to events which may or may not have much to do with corporate fundamentals. Fundamental value is determined by long-term corporate performance. Fundamental value today, in theory, should be based on each investor’s well-informed assessment of future corporate performance and risk; yet investors are not always well-informed nor sufficiently focused on long-term value. The constant downpour of hyperbole, punditry, and speculation in the media and on the Internet distracts from the economic factors which drive corporate performance. ACR has remained focused on corporate fundamentals and our past assessments of corporate performance have proven reliable. Only time will tell if our current assessments will prove to be as reliable. Put another way, we believe 2018 was a strong year fundamentally for our strategies, but our value estimates won’t be proven accurate until the financial reality of dividends, interest and per-share profit growth unfold. One final statistic on this score. At year-end, we estimated the S&P 500 P/E to be 28.4, whereas we estimated the EQR strategy P/E to be 9.96. In other words, we believe the market earnings yield was 3.5% and the EQR strategy earnings yield was 10.1%. Equally important, we believe the EQR portfolio of companies are higher quality and have similar or better return-on-capital and growth prospects compared to the average company. So, either the ACR investment team is woefully wrong, or ACR investors will be very pleased someday as price catches value. Assessing results today is further muddied by two historic economic events: (i) the longest economic expansion in US history (as of 2Q 2019), and (ii) a ten-year period in which we have not had an official bear market (defined as a price decline of over 20%). In our opinion, investors must now go back further than ten years to properly evaluate an investment manager, since an effective assessment requires an evaluation of returns in both and up and down markets – a fact which we believe will be lost on many investors to their own detriment. We believe investors have been lulled to sleep over the past ten years by the slow but steady expansion and are today largely oblivious to how much more asset prices and corporate debt loads have advanced compared to sustainable underlying cash flows. Nags like ACR who warn of these risks may come off like the boy who cried wolf. Eventually everyone stops believing the wolf will come. Then one day, there he is (dressed as a bear). The growing length of the economic cycle is not surprising. 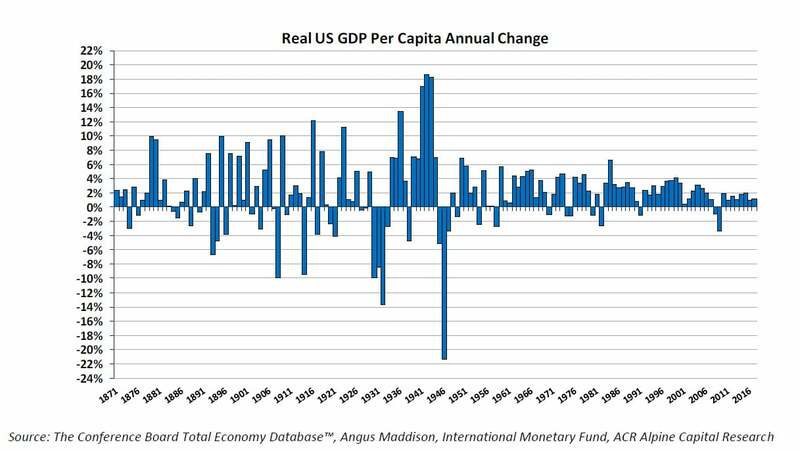 The following chart shows the annual change in GDP per capita since 1870. Recessions have become both less frequent and less severe since the 1950s. Progress! However, this picture of increasing stability is partially misleading. Economic stability has certainly advanced, but economic cycles have not been eliminated. The two macroeconomic figures which matter most for the average investor and worker – corporate earnings and unemployment – show the economic cycle is alive and well. 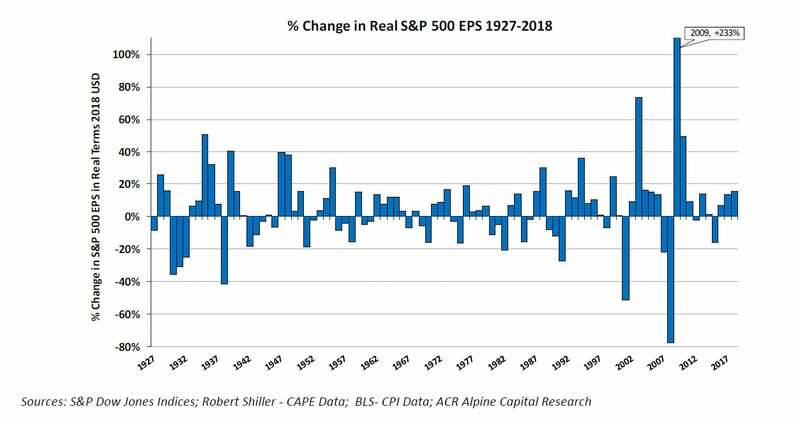 The volatility difference between GDP and S&P 500 EPS (earnings per share) looks insignificant, until one looks closer and notices that the EPS chart is on a scale approximately 3x greater than the GDP chart. Earnings represent the residual cash flows of enterprise, the riskiest “tranche” of the economy, at least until the layoffs begin. The volatility of corporate earnings is no secret. 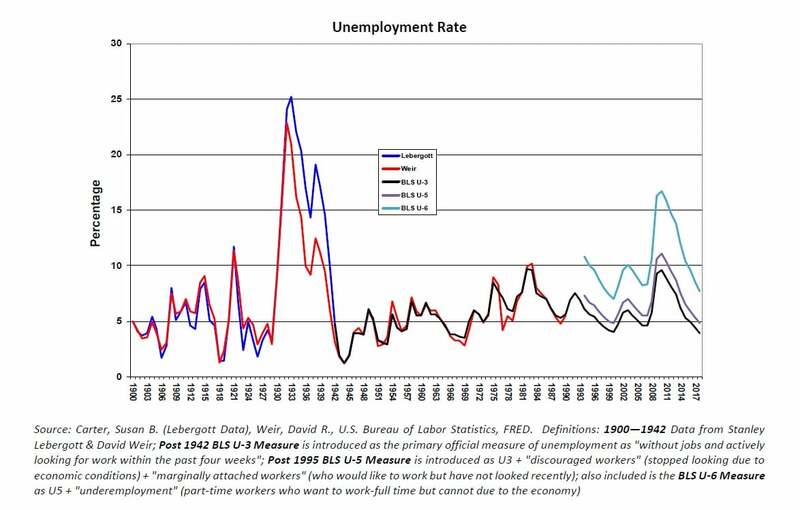 The more interesting observation in our view comes from the unemployment chart. The unemployment rate has never declined to its low and stayed there for an extended period. It has always marched right down to a certain level during expansion, made an about face, and marched right back up to the heart of the next recession. The smartest economists in the world cannot predict the exact level of “full employment” and the turn back toward recession. Our economic advisor Steve Fazzari has been steadfast in forecasting that economic growth coming out of the Great Recession would be slow and interest rates would likely remain historically low, but wisely he is unwilling to forecast precisely when the next recession will strike. Yet we all agree someday it will. The key for ACR investors is that we protect capital during the next cycle regardless of when it arrives and generate respectable long-term absolute returns in the meantime. Lastly, we would like to further clarify what we mean by capital protection. ACR seeks to protect our investors’ capital from impairment. Impairment is realized when a large price decline is justified by a major decline in security cash flows or a highly inflated original purchase price. Impairment is not downside volatility, though there is sometimes a fine line between the two. ACR’s ability to safeguard capital is sometimes evident in short-term price action, but not always. 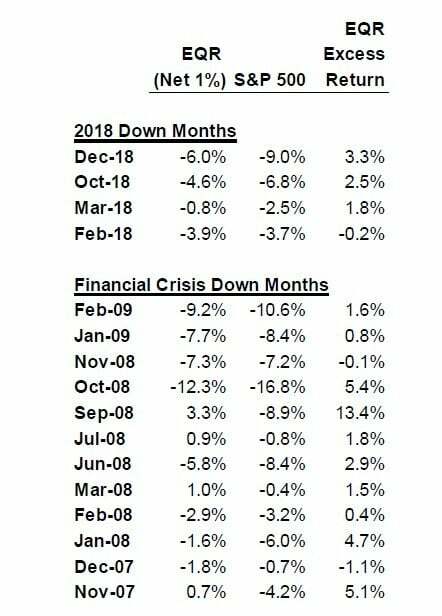 An illustration of monthly declines this past year and during the 2008 financial crisis demonstrates the lumpiness of “downside protection”. Forecasting that the EQR strategy would rise in price and gain 13.4% relative to the market in September of 2008 was impossible. Forecasting that someday we would perform well by knowing the fundamental value of our holdings and of the markets in which we compete is what we get paid to do. Said another way, the ACR investment team is good at knowing how much, not when. The requirements for investment success are simple: focus on the valuation of individual securities, commit capital only when there is a high probability of earning a satisfactory return, and intelligently assess the cost of holding liquid reserves. ACR looks forward to the continued execution of our strategy in the coming year, and we wish to thank our investors for your continued confidence, trust, and patience.